“The Best Leaders Don’t Shout” is designed for busy leaders who want remarkably simple and proven ways to build better workplaces, with more engaged teams, and happier customers. 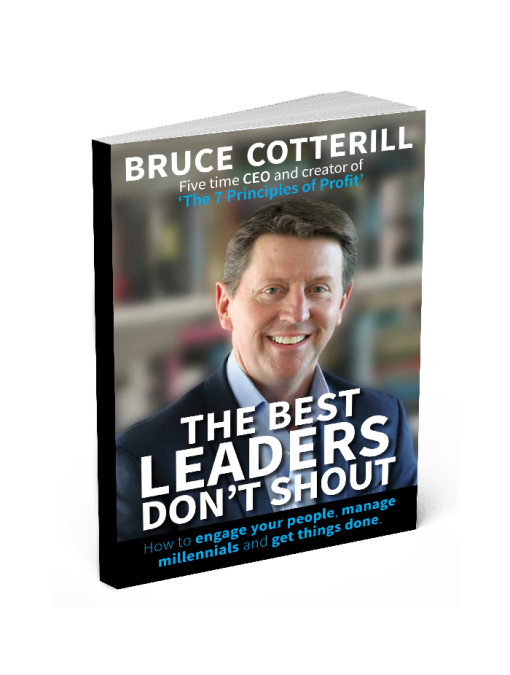 As a five time CEO, Bruce Cotterill has fought in the trenches. He has no time for over-complication and bureaucracy. And he has even less time for anything that doesn’t treat people with care and respect. 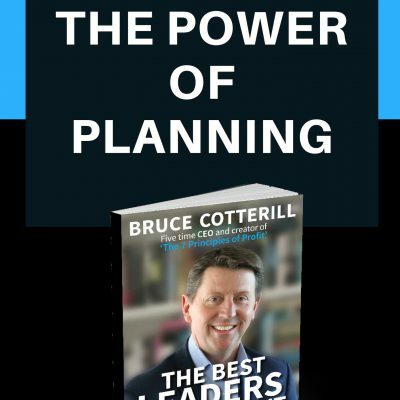 Bruce needed simple, effective, fast and human approaches to business improvement – and that’s exactly what you’ll find in this book. Within this stunning and easy to read book lies the answer to almost any situation that you could face as a leader today. No wonder companies are buying copies for their entire management team. 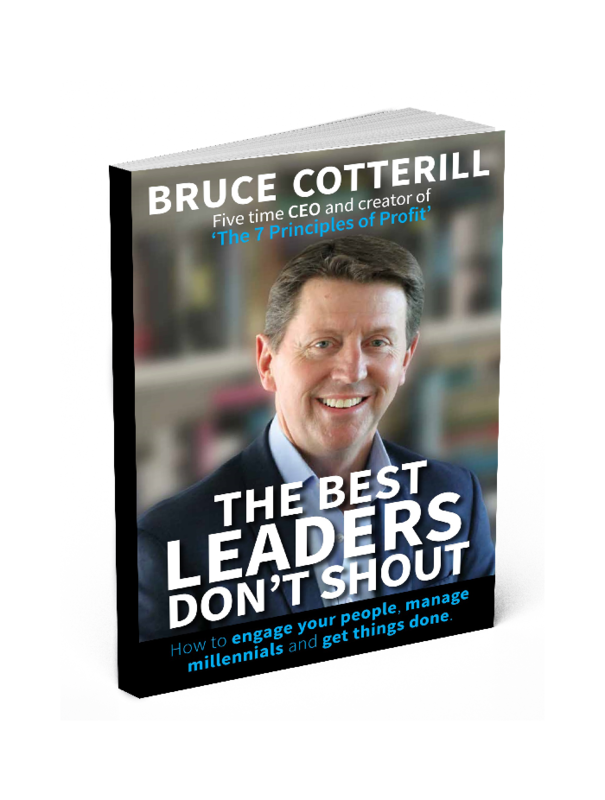 “The Best Leaders Don’t Shout” is designed for busy leaders like you, who want an entertaining read which guides them to build better workplaces, with more engaged teams, and happier customers. 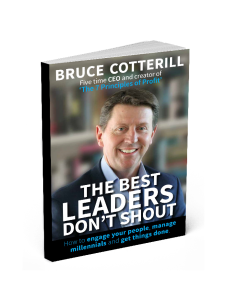 As a five time CEO, Bruce Cotterill has fought in the trenches. Every golden nugget is based on 30 years experience fixing broken businesses, and rebuilding shattered teams. Bruce has no time for over-complication and bureaucracy. And he has even less time for anything that doesn’t treat people with care and respect. He needed simple, effective, fast and human approaches to business improvement – and that’s exactly what you’ll find in this book. Bruce’s stories are entertaining, informative, and sometimes shocking. The book is a simple and jargon free guide to putting people first; and improving business performance when the world around you is anything but stable. Can you imagine being told in your first week that the company can’t make payroll? What would be the first thing you would do? How would you navigate it? … Bruce recounts this experience, and many many more. Have you ever had a book that you read once, and then referred back to time and time again? This is one of those books. Within this stunning and easy to read book lies the answers to almost any situation that you could face as a leader today. You might be a CEO looking for fresh ideas, or a middle manager looking to bring something extra to your role as you grow your career. Alternatively, you may be running your own business or looking to start one. Whatever team or organisation you are leading – there will be something here for you. No wonder companies are buying copies for their entire management team. Now more than ever, we need great leaders. So don’t just sit there – be entertained, be inspired, and be a better leader. “This is a very powerful book filled with laser-focused insights on how to lead an organisation to great success. It is one of the few business books I would consider a must read.” John Spence – a top 100 business thought leader in America. Where do you learn about leadership? Motivation – what drives your team?